File this under Ink Trivia. Which was your first bottled ink? Would you or have you repurchased it? Parker Penman Ebony was my first bottled ink. I used it mainly for drawing until some folks at Fountain Pen Network went all “drama queen” about how it was dangerous stuff and any pen that even caught sight of it would die instantly. Thankfully, it had yet to be paired with my newly acquired vintage Parker 51. Being a newbie and trusting “the experts” cured me of ever using Ebony again. Into the trashbin it went. Years later, I learned that Ebony just needed regular maintenance due to its heavy dye load and I greatly regretted tossing that luscious, dense ink. Discontinued in 2000, these days a bottle goes for upwards of $70 or more on eBay. No replacement bottle in my future, but Platinum Carbon Black is a worthy substitute for drawing. So that is the tale of my first bottle of ink. What is yours? Below is an ink comparison made several years ago. 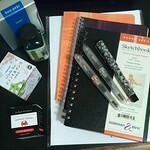 None is as rich as Penman Ebony, but I still use Noodler’s Black as an all-purpose ink and Herbin Perle Noire for general writing as well as in finicky pens. The remaining inks are fine but less neutral than the first two. Who knew black came in such variety! 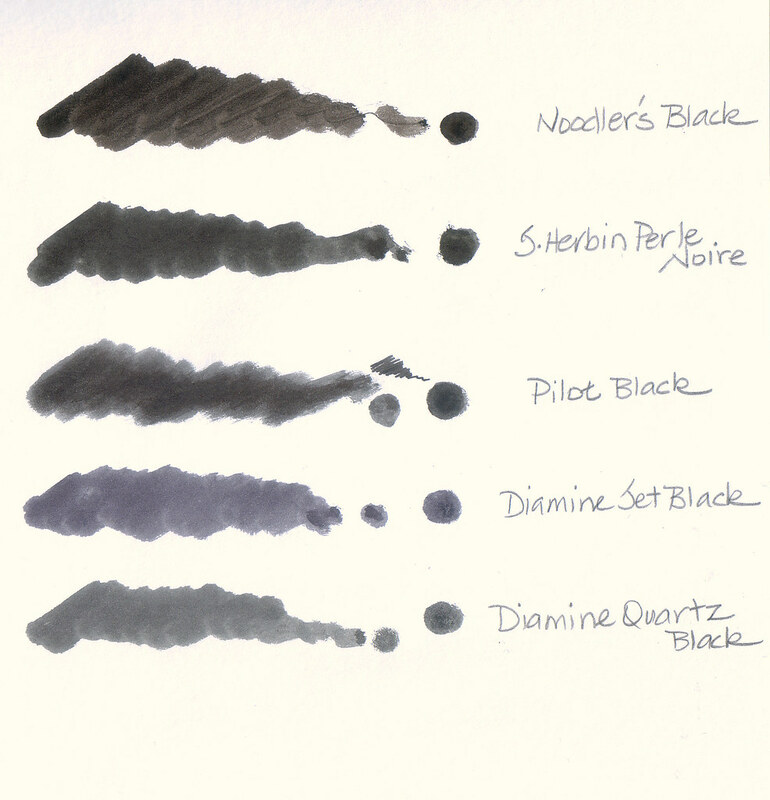 Which Discontinued Inks Would You Resurrect? If you could bring back back from the grave a few discontinued inks, which ones would they be? There are others, but these are inks I’ve used enough to know I will miss them when their bottles are empty. There are substitutes and worthy replacements, but no true duplicates for any of these inks. But that just means I get to move on to something new. And that isn’t necessarily a bad thing. 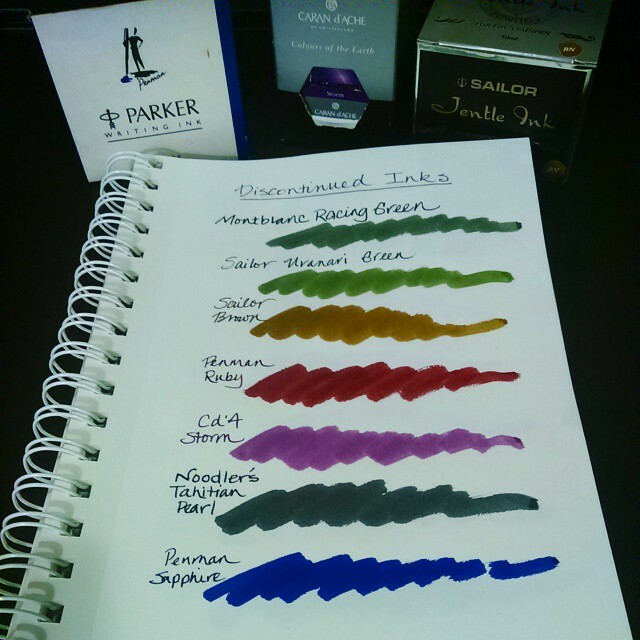 Which inks would be on your list? A thread at Fountain Pen Network about moldy ink made me curious about which brands of ink still contain phenol or another effective biocide. The EU’s rules for the manufacture of inks has affected a few brands though new formulations seem to have improved recent batches. While I have had a few bottles go bad, never has that happened with Noodler’s, Diamine, or any Japanese ink in my collection. Nor has it happened with ink in my collection manufactured more than five years ago. There is no intent to bash any ink but rather to find ink that, if stored for an extended length of time, is most likely to remain untainted. Parker Penman ink is a good example. It was only manufactured from 1993-2000 which predates any government tinkering. My stash remains viable with the exception of one bottle of Ruby that arrived partially used and containing SITB. The former owner was the culprit in that case. So who is making the good stuff these days? 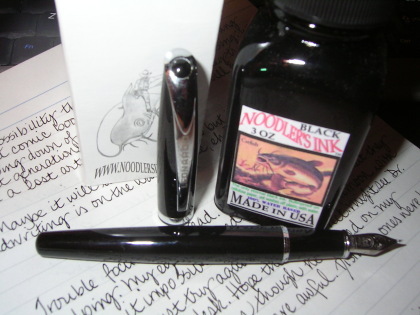 This bottle of Noodler’s Ink was purchased more than seven years ago and remains untainted. That’s what I call “the good stuff” and ink that is worthy of high praise.